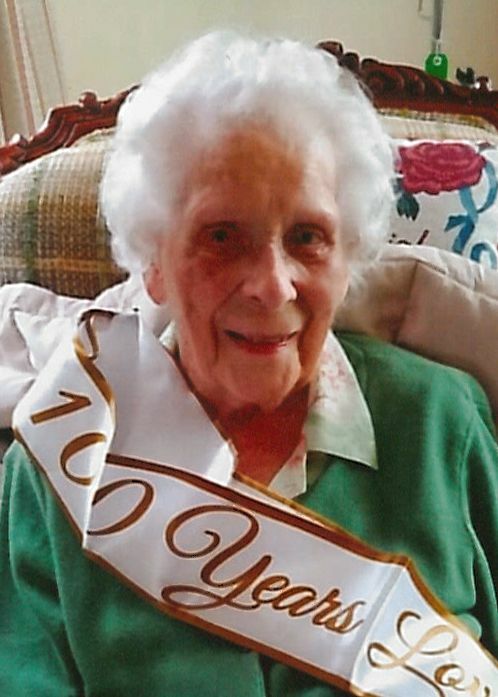 Virginia Marie O’Neil, 100, of Ossineke passed away Monday, October 22, 2018 at MidMichigan Medical Center – Alpena. Virginia Marie Skiba was born September 5, 1918 in Alpena to the late Michael and Anna (Misiak) Skiba. On November 7, 1938 she married John T. O’Neil. He preceded her in death on October 26, 1989. Virginia was a member of St. Catherine Catholic Church. Surviving are her eight children, Michael (Barb) O’Neil, Margaret (Dave) Przeslawski, Dennis (Dianne) O’Neil, Sally (Bob) Cain, David (Debbie) O’Neil, Mary O’Neil, Robert (Peggy) O’Neil, William (Christine) O’Neil; 23 grandchildren; 23 great grandchildren; 5 great-great grandchildren; sister-in-law, Aleen Green. Mrs. O’Neil was preceded in death by three children, Ronald O’Neil, Patrick O’Neil, Thomas O’Neil; siblings, Celia Weischowski, Tony Skiba, Clare Skiba, Harry Skiba, Ray Skiba, Phil Skiba, Ruth Wallen, Dorothy Brasher, and Frances Losinski. Visitation will take place on Thursday at St. Catherine Catholic Church from 11 a.m. until Mass of Christian Burial at 1 p.m. with Rev. Robert Bissott officiating. Arrangements have been handled by the Bannan Funeral Home.